Agility provides an opportunity for us and our dogs to think on the run or fast walk. 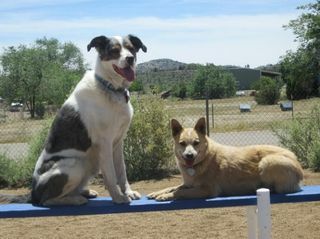 Agility enables us to bond as a team with our dogs. If your dog demonstrates the basic obedience skills of: Sit, Down, Stay, Wait, Leave It, Come, Here, Proper Walking (Heel) and Watch, they are welcome to attend sessions and classes. Dandy Dawgs Basics to the Streets is a prerequisite for this program. Sometimes dogs from the Dandy Dawgs Puppy Primary are admitted. All dogs on the agility field must be spayed or neutered. A wonderful bonus in playing agility with your dog is that you will learn to use your body to speak to your dog as you both move from one obstacle to another. This is a powerfully bonding experience for you and your canine pal. Dandy Dawgs Agility Field is designed for fun not necessarily for competition agility. Come have some fun whether you want to be agility stars or just have a good time! Contact Andy for more info, check dates or sign up for this dog training class today!